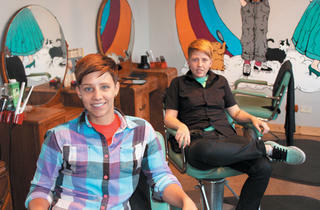 A new lesbian-owned hair parlor in Logan Square cuts to the chase. Photograph: Jason A. Heidemann SHEAR BRILLIANCE Berquist, left, and Wabbel are a cut above the rest. Wabbel and Berquist discovered an abandoned storefront in a plum location at Logan and Kedzie Boulevards and Milwaukee Avenue. After six months of negotiating permits, purchasing three vintage salon chairs among other shabby-chic furnishings, hiring a staff that now includes seven stylists, and outfitting the space with nifty decor (tiny terrariums and a brilliant mural in their own likenesses), the pair opened barbara&barbara hair parlor in June at 3131 West Logan Boulevard. That month, they closed the gallery to focus on the salon. Wabbel has given up art permanently while Berquist says the salon’s fixed hours have allowed more time to work on hers. 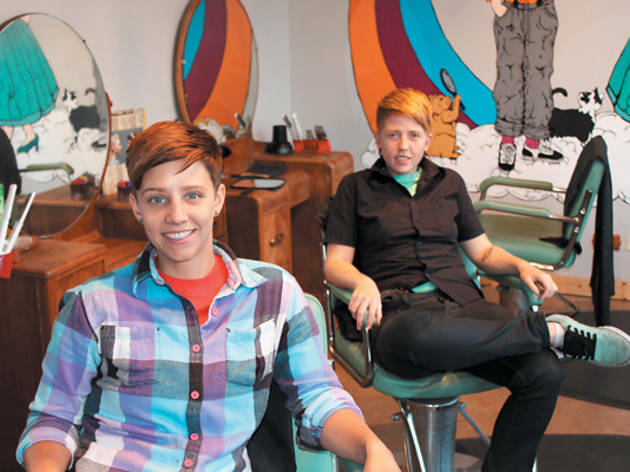 The duo, along with friend Carlin Thomas, also throw roaming loft parties for charity they call Queerer Park and are considering a second hair parlor in Austin, Texas. For more information, visit barbaraandbarbaraloveyou.com.